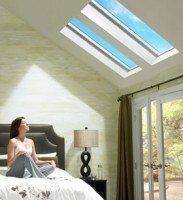 Velux Skylights Company | Wilmington DE | Homecraft Inc. Adding a skylight to your home will increase natural light intake during the day and give you a beautiful view of the Delaware night sky as well. Having Homecraft® install a skylight onto your home also helps to decrease your energy costs while increasing your home’s curb appeal. The increase in natural light that a skylight provides can lower your energy costs by decreasing the amount of time that your homes electric lights need to be on. Increasing natural light can even improve your health! Studies have shown that increasing the amount of natural light that your body is exposed to can improve the production of important vitamins such as vitamin D.
Sun Tunnel skylights are ideal for smaller rooms such as closets, hallways, laundry rooms and second baths. You can now add natural light to places you thought were impossible. We also offer accessories including flashings, sunscreening accessories, pleated shades, venetian blinds, roller shades, remote control systems and glazing options. Solar shades with Federal tax credits are available. Call Homecraft®, Inc. at 1-877-494-0377 today to schedule a free in-home estimate for Skylights. Or simply fill out our convenient on-line “Request a Quote” form.